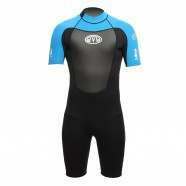 ION Wetsuits - ION Element 4/3mm Long Sleeve Overknee Shorty Wetsuit - Black :: Men > Wetsuits. 'Crash Padz': Neoprene pads to shin. ribs. 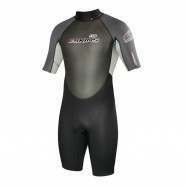 crotch and tailbone for extreme protectionContour Cut: Enhanced flexibility to collar. wrist. elbows insteps and knees for flexibility and comfortLeg Loop: Detachable Velcro to legs for easy entry and prevented water entryNeoprene Construction: Extreme stretch and lightweight comfortKey Sunglasses and key loops for securityGate Keeper: Velcro patches to batwing and neck closure for easy accessSeam Reinforcements: Melco Tape to seams to prevent ripsEntry: Zip fastening to back with zip guardMen's wetsuitL-Tex Protection: Highly abrasion resistant rubber to knee panelsDrain Holes: To calves and below zip enable water to exit easily Size: X-Large,Small.